Aside from the strong degree of product loyalty that leads somebody to consuming 1,825 cans of Cherry Coke per annum, in his mind one of the great advantages of both Guinness and Coke was that both firms earned most of their cash overseas. Add to that a legendary brand status and it was an advantage that gave them a relatively large runway for future growth, something that Buffett felt was not adequately reflected in their bog stand valuations at the time. For example, in 1991 Guinness stock was trading at just under 16x its annual earnings per share. 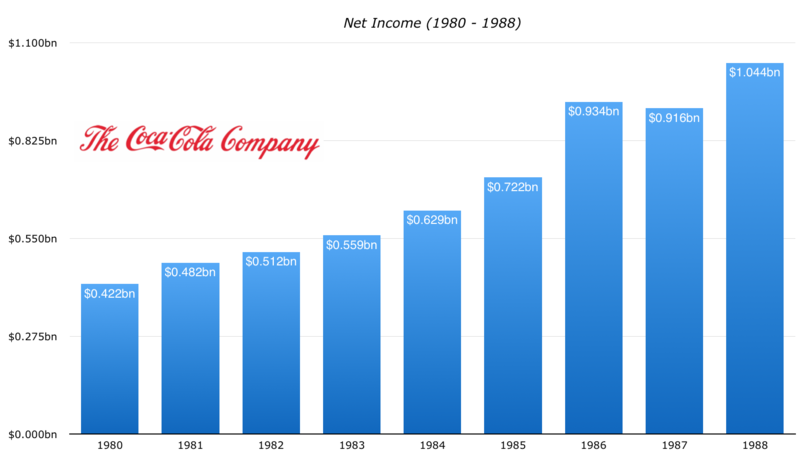 In early 1989, when Buffett and Berkshire had completed their first $1 billion investment in Coca-Cola, shares in the Atlanta based beverage giant were also going for about 16x their 1988 profits. What’s so neat about looking over the Coke and Guinness (now part of Diageo) investments is that they are perfect examples of blue chip value investing. Sure its not deep value, these kinds of stocks rarely offer that unless you find yourself in those once-in-a-lifetime market moments like the Great Depression or the 2008 financial crisis. Even in the case of the latter, Coke stock only went to 15x annual earnings at its low point in March of 2009. Such high quality earnings, and at the time a very good prospective rate of earnings growth, meant paying 16x those annual profits to own the underlying profitability would prove to be a steal in the long run. I mean think about Coca-Cola back in the late-Eighties. The net income growth figure for the decade comes out to about 12% annually on average. The underlying earnings quality was exceptionally strong and stable: net margins were consistently in the 10% area and the firm also had a consistent track record of capital light operations. This allowed Coca-Cola to be incredibly shareholder friendly, only requiring relatively small amounts of capital to maintain and grow its operations, just like today. The rest could go towards enriching shareholders through the usual channels such as dividends and stock repurchases. Between 1983 and 1988 the company retired 11% of the shares outstanding, giving its shareholders a greater a slice of future profits and dividends. In addition, it had continued its traditional policy of increasing payouts – steadily bumping its dividend up each and every year like clockwork. 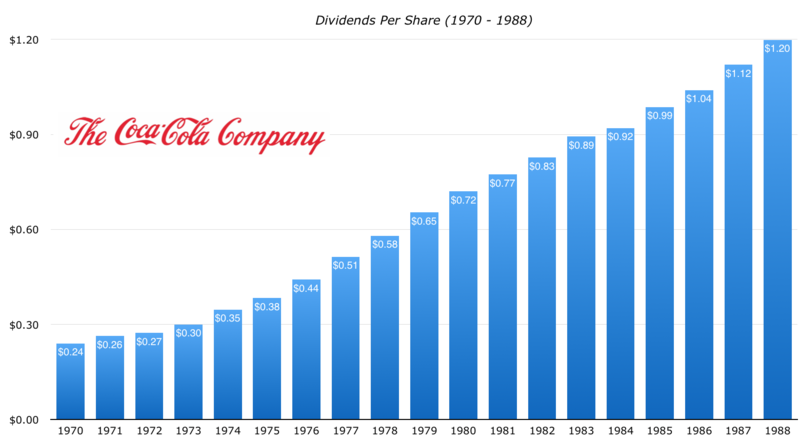 Between 1970 and 1988 Coca-Cola raised its dividend by a compound average of 9.35% a year, from $0.24 per share at the start of the seventies to $1.20 in 1988 (figures split adjusted up to and including the 3-for-1 stock split in 1986). That set the scene for Buffett as a compelling long-term investment case, one which saw Coca-Cola make up about a third of Berkshire’s common stock holding at the time. Hindsight is a wonderful thing: it looks obvious to anyone reading Buffett’s thoughts from back then that this was a no-brainer. I mean what’s not to like? You get a great company with a mega-brand, good growth prospects, a capital light enterprise which is extremely cash generative, where a large portion of that goes directly to benefiting shareholders and which can reasonably be expected to grow as well. The company was dumping Colombia Pictures and was focussing on the core drinks business. The Coca-Cola Company’s two unique and invaluable assets – our trademarks and our worldwide system -make us the world’s only truly global soft drink’s company. In 1988, more than 200 billion servings of our soft drinks were sold worldwide. No other company sold even half as much. There are probably many ordinary investors out there who did what Buffett did, not with 6% of Coke stock and a billion bucks, but putting a good chunk of cash to work, knowing that two or three decades down the line there was a very high chance that their investment would be worth significantly more than it was then. As for that initial purchase by Berkshire, what is it worth today? Well, for every $1,000 of Coca-Cola stock purchased at the start of 1989, the firm has paid out about $5,250 to stockholders in cash dividends. The yield on cost today would be around 50%. In addition, every $1,000 invested in Coca-Cola stock back then is worth about $15,500 in capital today. That’s equivalent to a total return of 11.90% compounded per year over a nearly thirty stretch, and without including what the effect would have been of reinvesting those dividends into more shares. An astonishing performance for a fairly unremarkable investment in the world’s largest soft drink’s company.